Display your treasured possessions in ornate style with this vintage sconce designed wall shelf. Semi circle shelf with silver metal sconce and wood shelf, perfect for displaying in the living room or hallway for a dramatic statement. Beautifully designed with 4 ornate scrolled arms that hold up a natural wooden shelf. The vintage design highlights the vintage French styling, complete with classic Fleur De Lys detail. This shelf will be perfect for displaying your favourite ornaments, candles or trinkets. Why not make a fantastic ornate display with 2 shelves on either side of a fireplace wall to make a unique and interesting display. 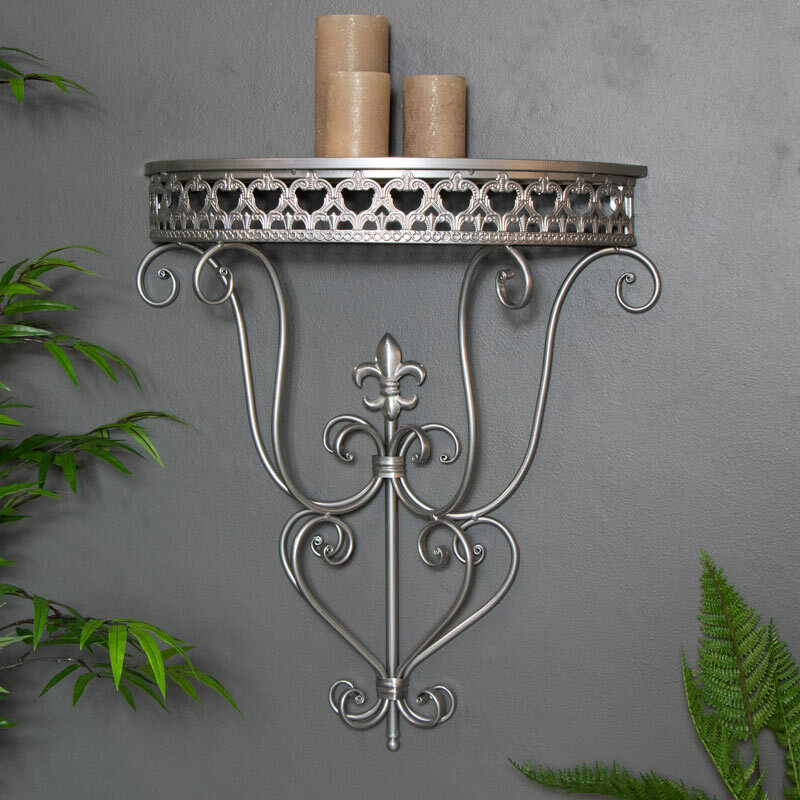 Display your treasured possessions in ornate style with this vintage sconce designed wall shelf. 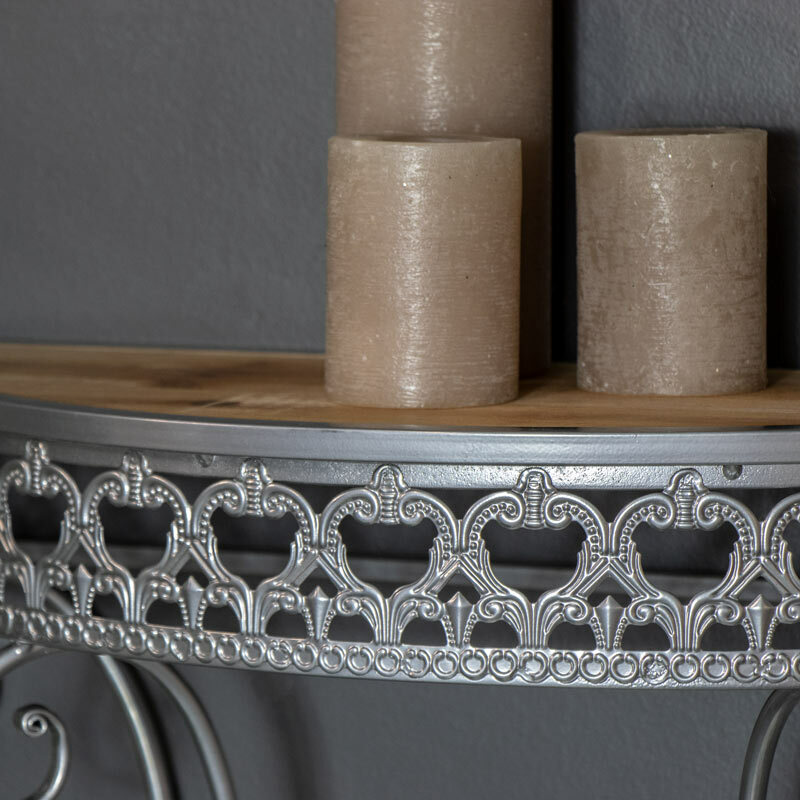 Semi circle shelf with silver metal sconce and wood shelf, perfect for displaying in the living room or hallway for a dramatic statement. Beautifully designed with 4 ornate scrolled arms that hold up a natural wooden shelf. The vintage design highlights the vintage French styling, complete with classic Fleur De Lys detail. This shelf will be perfect for displaying your favourite ornaments, candles or trinkets. Why not make a fantastic ornate display with 2 shelves on either side of a fireplace wall to make a unique and interesting display. Looking for a way to organise your home or work place, we have a great range of storage solutions that will suit any decor. From wall shelves to floor standing shelves in wood and metal, from the vintage, shabby chic to the retro, industrial we have it all!